This study quantifies the nationwide land cover and long-term changes in forests and its implications on forest fragmentation in Nepal. The multi-source datasets were used to generate the forest cover information for 1930, 1975, 1985, 1995, 2005 and 2014. This study analyzes distribution of land cover, rate of deforestation, changes across forest types, forest canopy density and pattern of fragmentation. The land cover legend for 2014 is consisting of 21 classes: tropical dry deciduous sal forest, tropical moist deciduous sal forest, subtropical broad-leaved forest, subtropical pine forest, lower temperate broad leaved forest, upper temperate broad leaved forest, lower temperate mixed broad leaved forest, upper temperate mixed broad leaved forest, temperate needle leaved forest, subalpine forest, plantations, tropical scrub, subtropical scrub, temperate scrub, alpine scrub, grassland, agriculture, water bodies, barren land and settlements. The forest cover statistics for Nepal obtained in this study shows an area of 76,710 km2 in 1930 which has decreased to 39,392 km2 in 2014. A net loss of 37,318 km2 (48.6%) was observed in last eight decades. 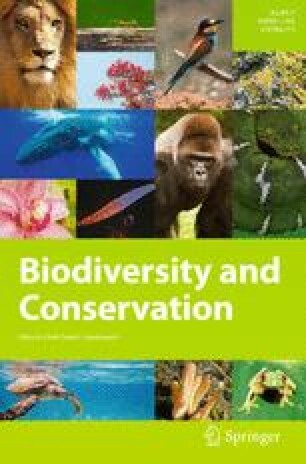 Analysis of annual rate of net deforestation for the recent period indicates 0.01% during 2005–2014. An increase in the number of forest patches from 6925 (in 1930) to 42,961 (in 2014) was noticed. The significant observation is 75.5% of reduction in core 3 forest, whereas, patch, perforated and edge classes show the increase in percentage of fragmentation classes from 1930 to 2014. The results of this work will support the understanding of deforestation and its consequences on fragmentation for maintaining and improving the forest resources of Nepal. The online version of this article (doi: 10.1007/s10531-017-1423-8) contains supplementary material, which is available to authorized users. This study has been carried out as part of ISRO’s (Grant No. 2011) National Carbon Project. We gratefully acknowledge ISRO-DOS Geosphere-Biosphere Programme for supporting this research. The authors are thankful to Dr. V. K. Dadhwal, former Director, NRSC, Dr. P. G. Diwakar, Scientific Secretary, ISRO and Dr. P. V. N. Rao, Deputy Director, NRSC for suggestions and encouragement. Thanks are due to anonymous reviewers for critical comments and suggestions.